Don't you think those just small quiet moments during the holidays are the best? I do. 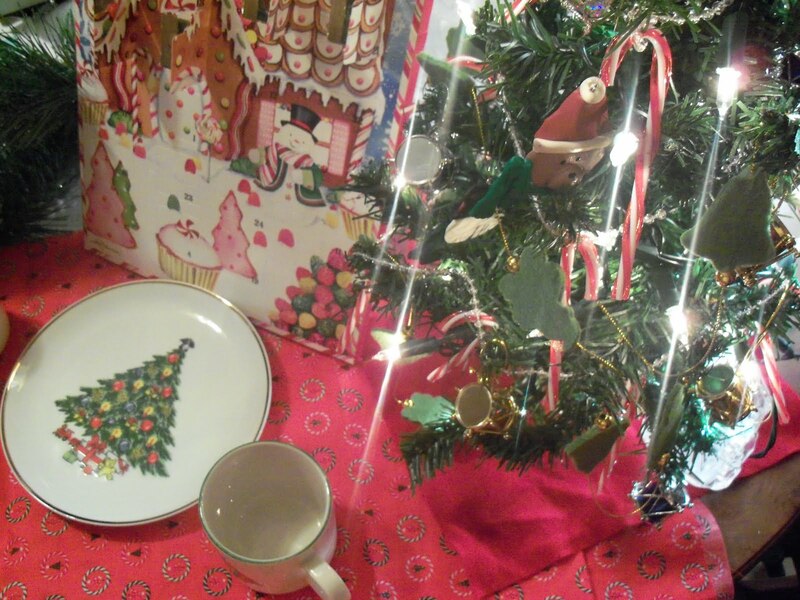 We found a small tabletop Christmas tree at a thrift store for $1.50. We thought it would be fun to put a tree on the princess's dresser. I had a set of lights and I took her to the dollar store and told her she could pick out her own ornaments. Of course, I was having visions of pretty girly pinks and purples to match her room but, that wasn't what she was looking at. LOL She picked out some candy cane garland, green felt bell garland, bright little drums and a Santa, bear, snowman and reindeer ornament set. Okay then! 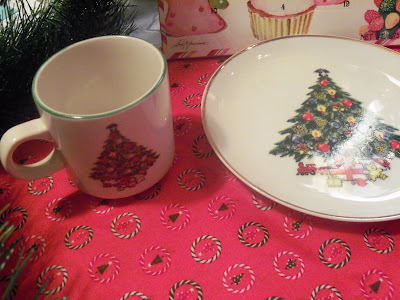 I picked up this little 3 piece Christmas tree dish set for .50 cents at a thrift store. 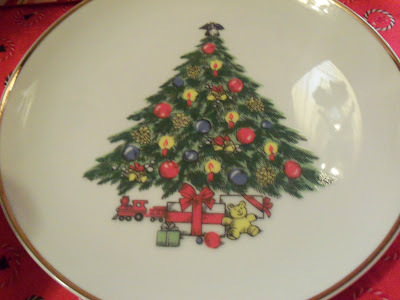 I thought the set was the perfect dishes to use for this monumental Christmas tree moment! 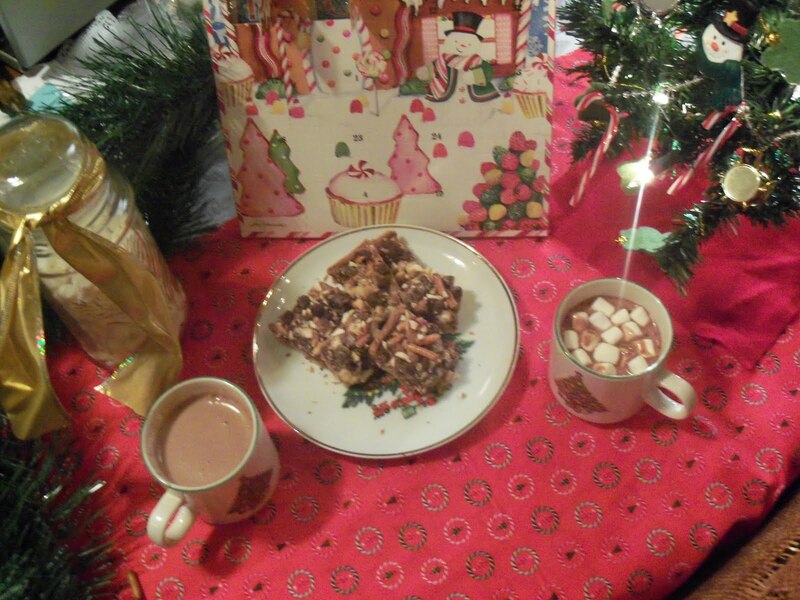 We decided to just sit at the table and gaze at her tree for awhile and enjoy some treats and hot chocolate. A truly wonderful moment! 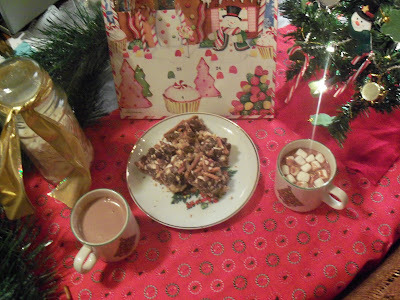 Now, these treats don't photograph very well. They look dry. but, let me tell you, they are yummy and very rich! 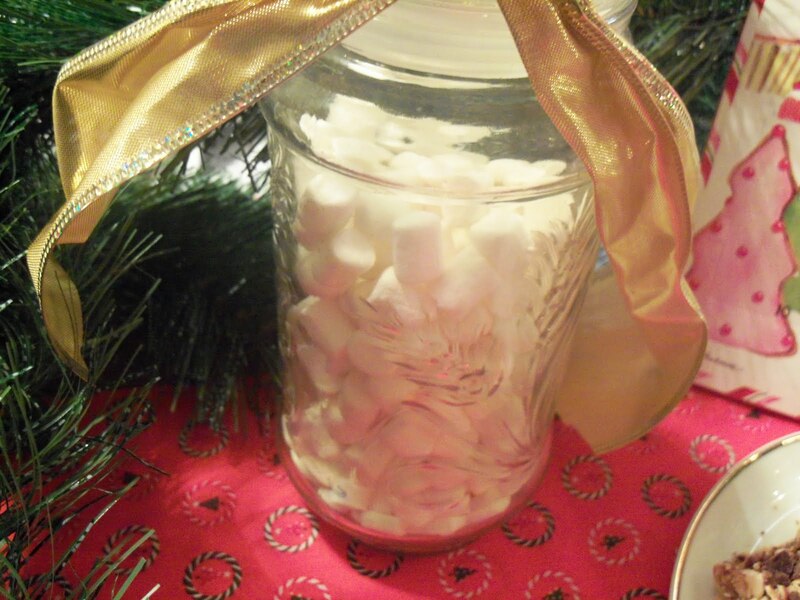 I just tried this recipe and will make more. Recipe is at the end of the post. 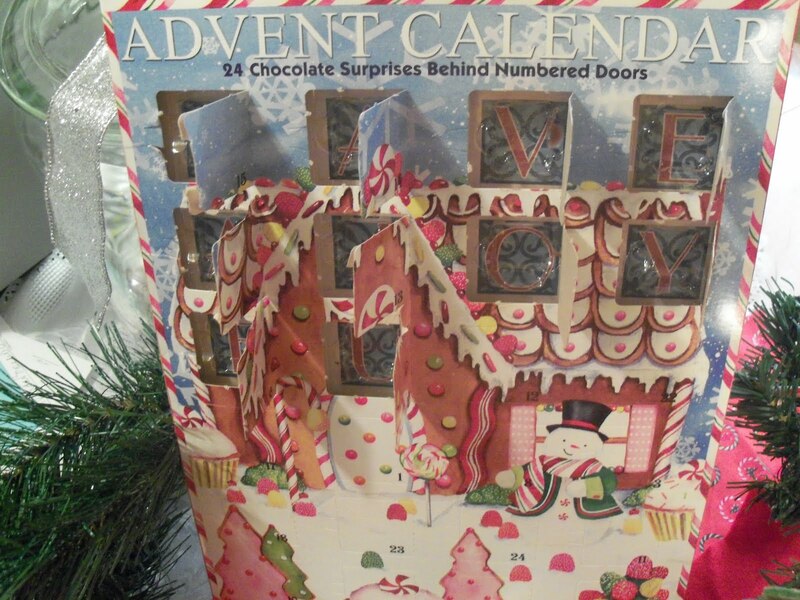 And of course, every morning includes opening up a goodie in the advent calendar. Lots of pink, the princess always comments on how pretty it is. As you will see, I don't follow the days correctly. I like them to go in order. LOL (a little OCD maybe?). We have another fun advent calendar that I got last year and you can redo it each year. I will show that Monday. And Beverly over at How Sweet the Sound, hostess of "Pink Saturday" has asked us what our favortie holiday movie is. 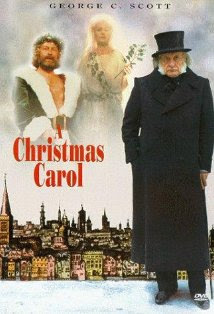 My is A Christmas Carol starring George C. Scott. Troy and I watch it every Christmas Eve. When we return home that evening after exchanging gifts with family, we get the things we need to get done and then curl up on the couch and enjoy a special snack for just the two of us and watch the movie. I love this time we have! So, that was our fun little morning. Just another little special moment that makes life so amazing! 1) Heat oven to 350°F. Spray 13x9-inch pan with cooking spray. 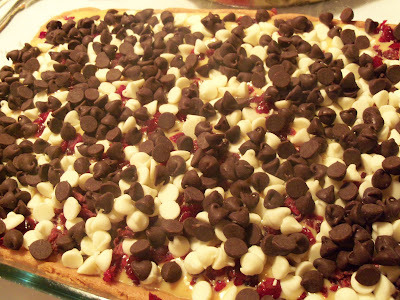 Break up cookie dough into pan. With floured fingers, press dough evenly in bottom of pan. 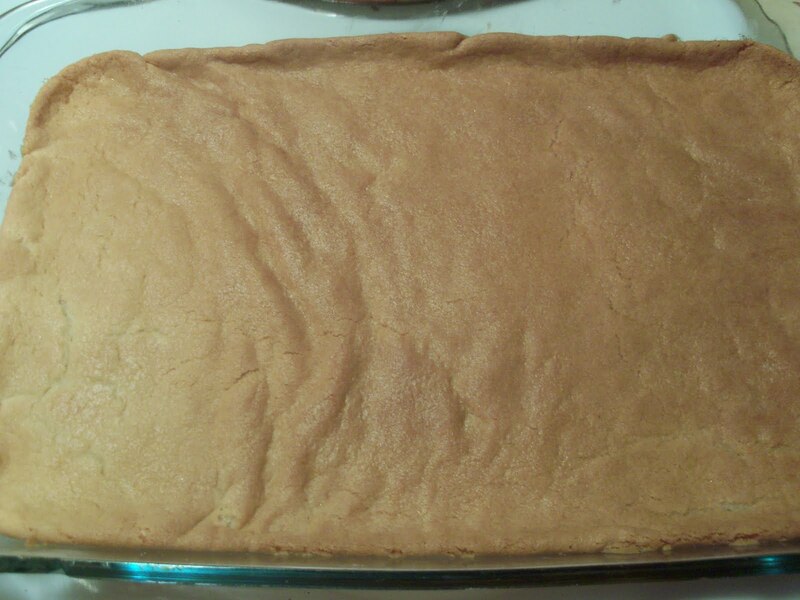 Bake 18 to 20 minutes or until puffed and edges are golden brown. 2) In medium bowl, beat condensed milk, orange peel and egg with whisk until combined. 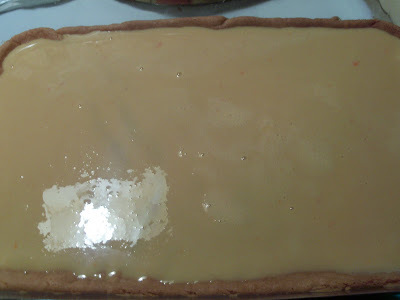 Remove partially baked crust from oven. 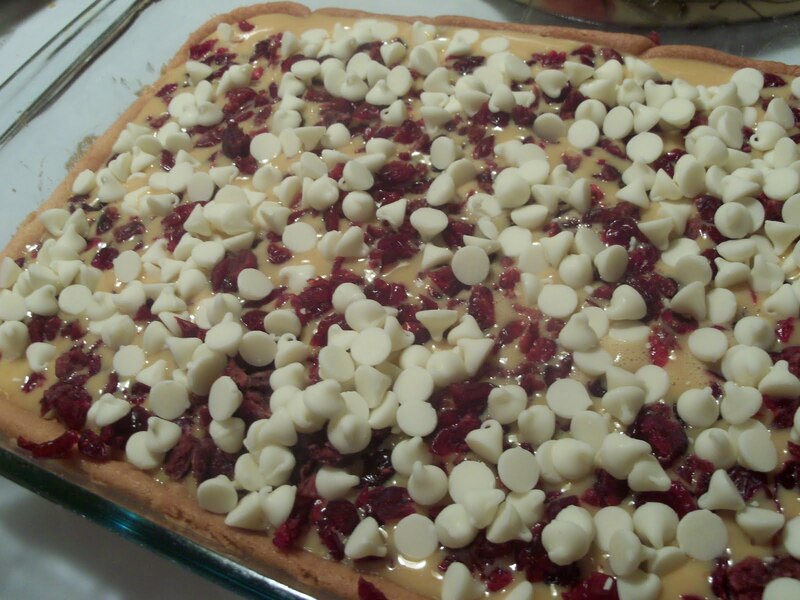 Spread milk mixture evenly over crust; sprinkle evenly with cranberries, chips and pretzels. 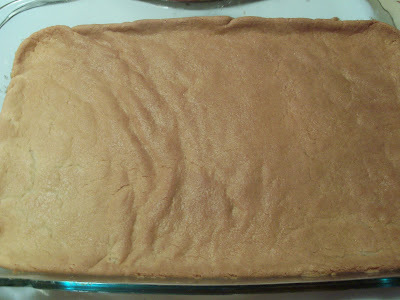 3) Bake 25 to 30 minutes longer or until center is set. Cool 1 1/2 hours. 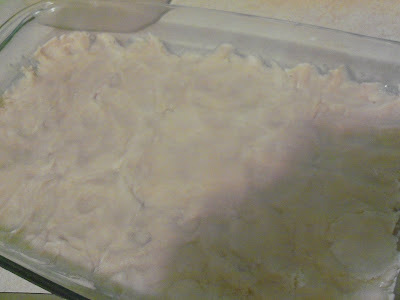 Refrigerate 30 minutes or until chocolate is set. Frozen cranberries can be substituted for the fresh, but be sure to thaw them first. I am joining the following parties! Cookie Exchange & Cookie Exchange here! My little prince and I did a tabletop tree in his room to, so much fun!! Your recipi sounds delicious! Thx for sharing!! Yay Diann...such a sweet and beautiful post...those special moments are the best! 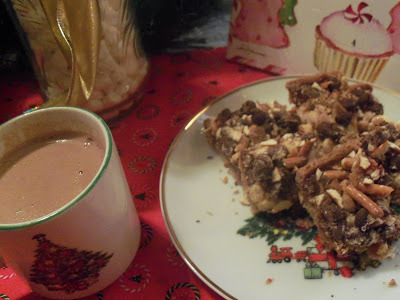 Super-beautiful photos and ..yummy recipe..what a treat..another fabulous post! THanks for sharingr your magic! 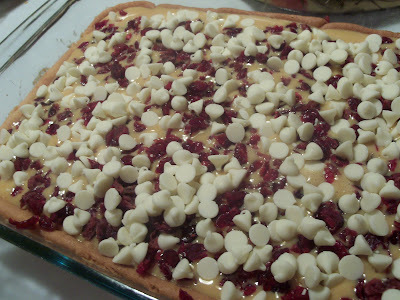 This blog is making me so hungry. I'm going to go and grab some sweets and turn on the Hallmark channel to watch some holiday movies. Her tree IS so beautiful! Especially because you did it together. How awesome for you both. You are definitely in the thrifty groove! Thanks so much for stopping by for Pink Saturday. ENjoy the day! PS... I also love the fact you did an advent calendar. My little Bebe is two and we need to do that for next year. I LOVE Mr. GCScott...he is one of my very favorites. I loved this movie, too. OMGosh, I am makin' these bars..they look amazing. Wonderful Pink Saturday post Diann! The little tree is beautiful. Sweet memories made with your little girl! 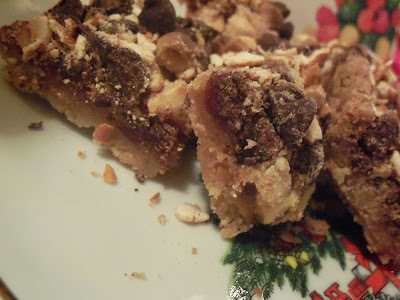 I'm adding this recipe to my candy list for next week! Great PS post! I love that movie, too! 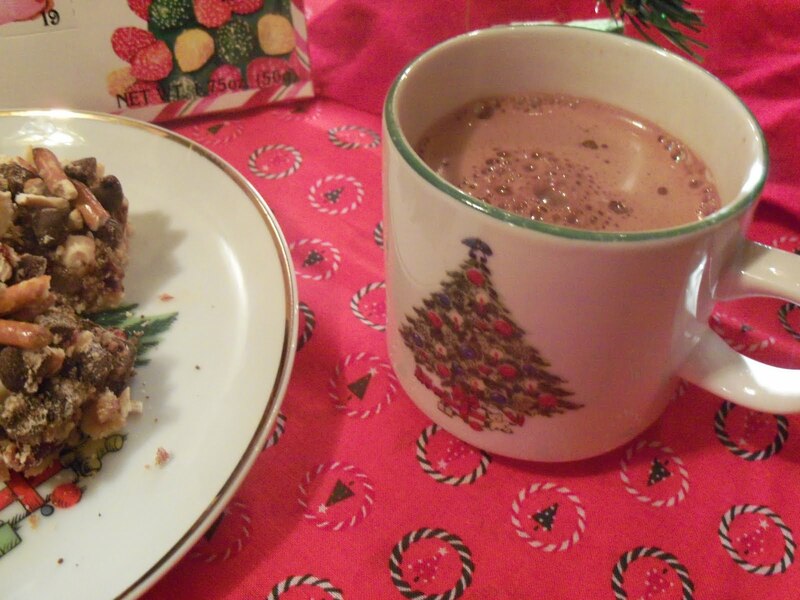 I'd love to have a steaming hot cup of cocoa in your pretty Christmas mug!! All that and a recipe too. Wonderful post and I think you are making some special memories with princess. Just lovely. Happy Pink Saturday. Great story about your princess' tree. Don't you love how kids just do things their own way! 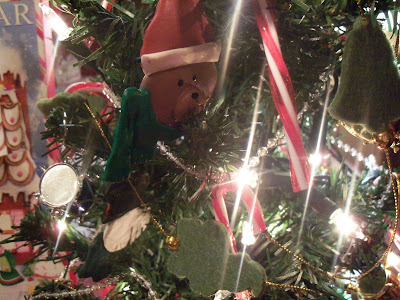 When my son moved out, he took his little tree from childhood -- made me smile and tear up too. 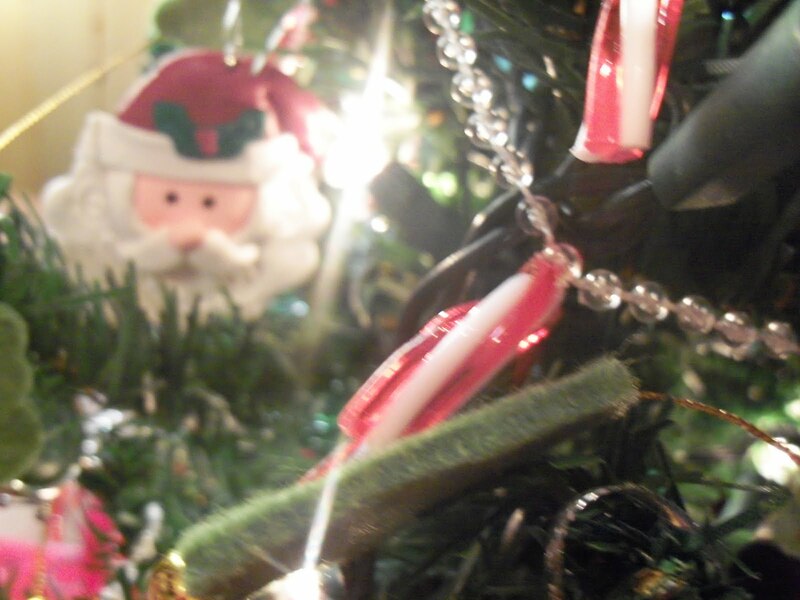 What a sweet little tree -- I love Christmas traditions -- such memory makers for when we get old and grey (not me!)! Such a pretty tree. I love how when we see things through the eyes of a child, just how magical things really are! I know you are enjoying these moments. The snacks look yummy too! Isn't it fun to make special memories like this for our children? I remember such moments with Chickie. I know we'll both remember them. What a gift. Oh no! 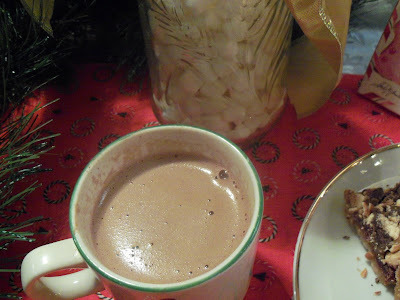 Now I want cocoa and we don't have any! You are so right! it is the little things! SO TRUE! oh now I really miss sharing those special moments, my boyz are all grown up. Tell your precious princess her tree is divine! Thanks for sharing the recipe too! Hugs and blessings for a wonderful Christmas! Loved you beautiful Christmas post.. If i didn't have to watch my intake of sugar, I'd have a bit of all those goodies. Sounds like a perfect day of making memories! Thanks for stopping by! Awwww how adorable of that sweet little princess! I see your daughter has the same talent as her momma! Tell her I think it is very beautiful. Princess's tree is so precious. I hope you mark each of the ornaments with the date for her to remember when she picked them out for her own tree. Those are memory makers, for sure. What a wonderful way to spend time with your daughter, these memories will stay with you both forever. Your daughter's tree is so precious! The goodies look very yummo! What a pretty little tree. The bars look so good - thanks for sharing the recipe. When I saw the marshmallows in the chair it brought back good kid memories. 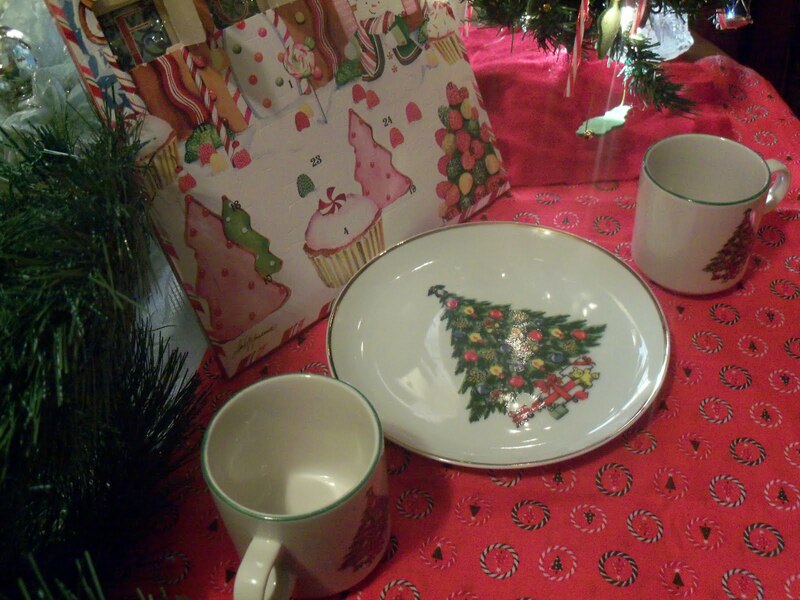 The Christmas dishes make me want to come to your house & visit. LOL. Visit me if you have a chance & follow back. What a special time for you two. 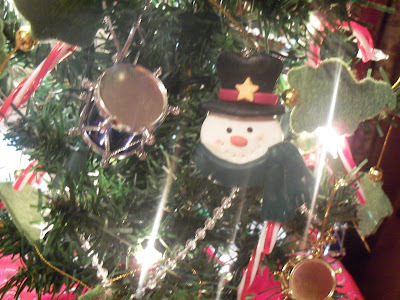 Your little darling picked out wonderful ornaments! !The hot chocolate looks yummy. 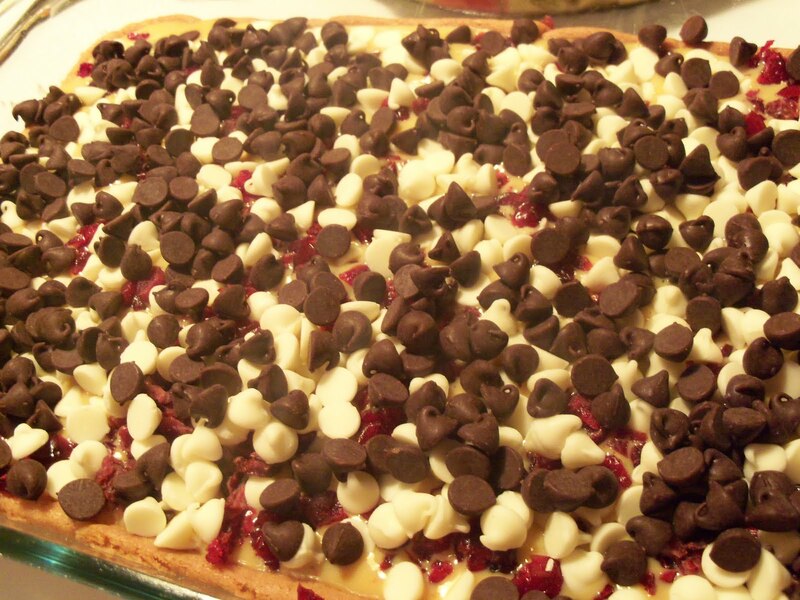 What a yummy post, Diann! 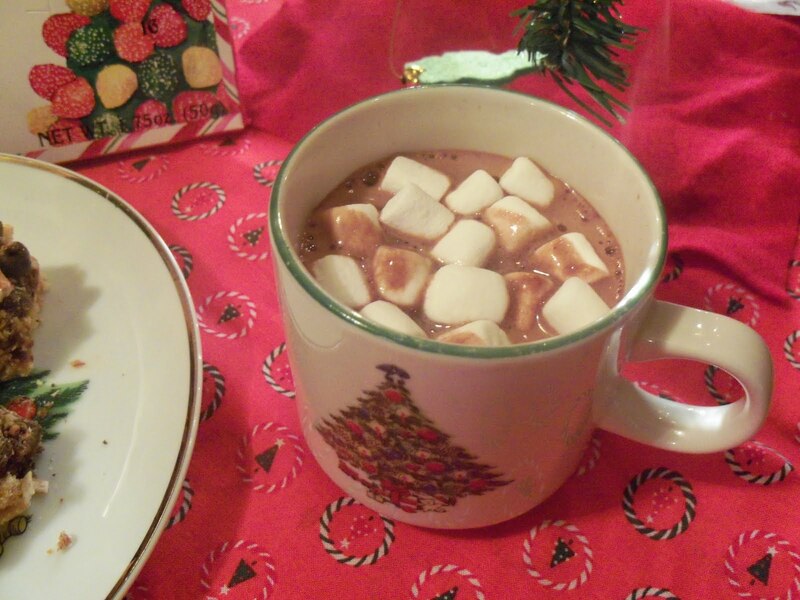 Very festive and I would enjoy some hot chocolate in your Christmas mug! Happy Pink Saturday and thanks for sharing. That looks YUM-MY! Love the mini Christmas tree - sweet story! Everything about this post is heavenly! ok, I am officially making those! Oh Yum! I don't think they look dry at all, I think they look like a big hunk of chocolatey goodness! :-) Thank you so much for linking them up to our Cookie Exchange! What a beautiful series of photos. I love the dishes and the mug and the decorations. Oh... and I love the sound of those bars. Might be perfect for Christmas Eve. I bet Santa would like them. Oh my Diann! These look so good! I am so going to make these! 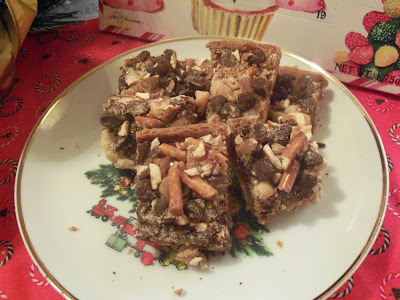 I love the sweet, chocolate, salty combo you get with these. 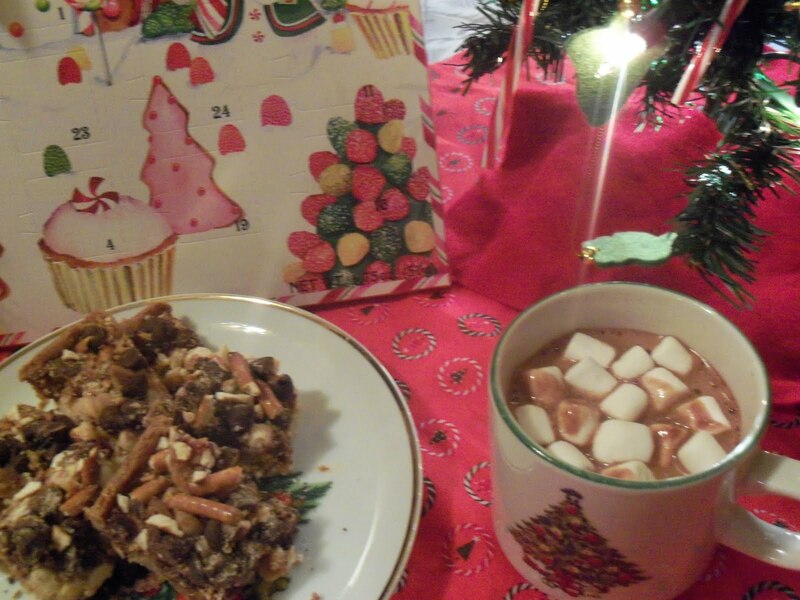 Thanks for sharing such a great recipe at our Sister Saturday Cookie exchange! Oh wow, thats it i am going to the kitchen for a snack! The tree is so cute and the story even better! Happy Pink Saturday. Yum! That looks delicious! I love those dishes too. All these treats are making me hungry and it's almost bedtime for me so no more snacks tonight! 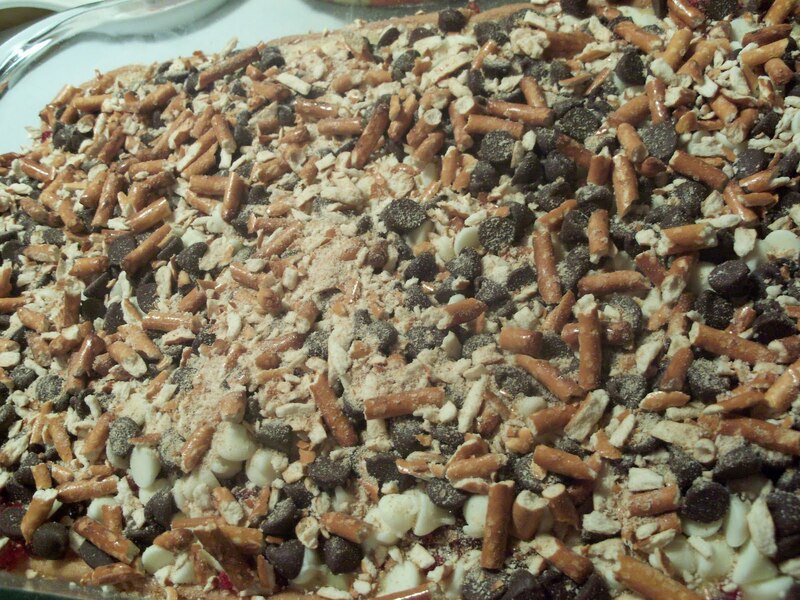 The treats sound good except for the pretzels. Great photos! 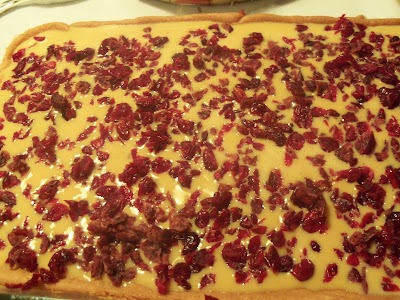 My husband and I try to eat a lot of cranberries. 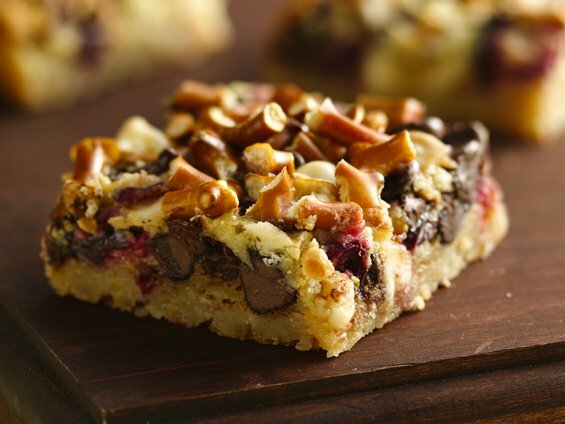 I'll have to try the "Cranberry Layer Bars". Looks yummy!